In 1993 two major composers – Michael Colgrass and Bruce Mather – began work on commissions for NEXUS. Mather, an intimate friend of Robin Engelman, had already composed two quartet pieces for us: Clos de Vougeot (recorded on the LP Changes in 1982) and Clos d’Audignac (recorded on the CD Rune in 1997). The new commission was for a concerto that would be premiered with the Esprit Orchestra, directed by Alex Pauk. Mather’s Tallbrem Variations was completed in 1994, and premiered in Toronto on March 29, 1996. Numerous early 20th century performers claimed it was humanly impossible to memorize 12-tone music, a proposition quickly disproved by the following generation. Nevertheless, the abstraction of Mather’s 12-tone system compounded my memorization challenges on the pans. 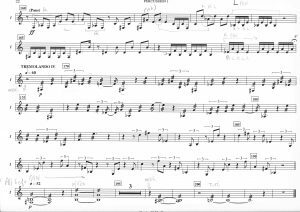 Even after four years of playing them in From me flows, I was like a hunt-and-peck typist – I couldn’t sight read simple phrases, or play a chromatic scale faster than one note every two seconds. As before, I needed to commit to memory the entire pan part for a 25-minute concerto. A sad fact of life for a performer of new music is many significant works are heard in public only once, even pieces that require a heroic amount of effort to prepare. Tallbrem Variations suffered the same fate, although at least the premiere was recorded and broadcast by the CBC. I knew Bruce fairly well from work on his previous music, but the extent of our collaboration in this case was limited to my sending him a diagram showing the layout of pitches on the two pans, and a letter with some observations about writing phrases whose notes cross from one pan to the other, particularly when using any tremolo effects. Tremolo is an important feature in all of Mather’s percussion writing, and this piece was no different, including four sections literally labeled “Tremolando” in the score. The low register of the tenor pans can produce a beautiful sustained baritone sound when played tremolo, but the simple fact that the notes of the chromatic scale are spread out asymmetrically across two large and separate surfaces makes playing legato with tremolo really difficult – unless the pitches involved happen to be all on the same drum. In order to contend with this problem in From me flows I had developed some ability with playing one-handed rolls on pans, but Mather’s use of tremolo was extensive. Finding ways to shift quickly between the drums in order to connect rolled notes was one of the major technical challenges in my part. Since I didn’t need to play other instruments simultaneously with my pans this time, I mounted them horizontally using traditional stands (but still maintaining my “backwards” right/left arrangement). I also began using a timpani stool so I could play in a seated position. I felt more relaxed this way, and seemed to get a better sound. It also eased the fatigue of standing throughout a half-hour piece. I’ve always played timpani this way, and perhaps there was some familiarity with a similar posture. I thought the sound of steel pans fit well with the delicate and transparent nature of Mather’s music. After finally learning the piece, I found it very enjoyable to play. The Esprit Orchestra is a fine ensemble, and the concerto was given an excellent performance. It’s a shame it hasn’t been played more since then, but at this point any future concerts won’t be by NEXUS. Younger ensembles should take a serious look at this work now. Michael Colgrass, the well-known Pulitzer Prize-winning composer and former percussionist, was commissioned to write a work to feature the virtuoso flutist Marina Piccinini and four members of NEXUS. Prior to beginning work on writing the piece, Michael had meetings with each of us. We discussed possible instrumentation and logistics, the latter topic being of great concern if we were going to be able to tour with the piece – an opportunity that everyone, including Marina, hoped would be forthcoming in the future. André Jolivet’s Suite en Concert pour flute et percussion and Lou Harrison’s First Flute Concerto, would be included on the premiere concert so, with the addition of a solo flute piece and a piece for NEXUS alone, we had a ready-made tour program. At our meeting Colgrass and I had a vigorous and stimulating discussion about music in general and the new piece in particular. Michael is a brilliant thinker, and a triple-threat author, composer and lecturer. He was excited about including steel drums in his music, and I was looking forward to getting a part from someone who actually knew percussion instruments first-hand. I gave him the same diagrams and general suggestions regarding pans that I had given to Bruce Mather. I also made it a point to stress the importance of keeping the proliferation of equipment under control if he wanted to hear his piece played more than once. Unfortunately, even a percussionist-composer can lose control of this very practical dimension of working with a percussion group. When I saw the final score for A Flute in the Kingdom of Drums and Bells I felt completely deflated. 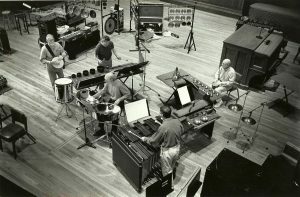 The steel pan part was very well written and collaborated beautifully with the solo flute; however, the total inventory of equipment required for the piece was enormous, including a grand piano. Part of the conception for the piece was the flutist physically “visiting” various percussion stations, and interacting with the performer(s) there. That made consolidating the placement of all the instruments even more problematic. The final setup for the concert, given on January 11, 1995, completely covered the stage in Toronto’s George Weston Recital Hall, a venue that can fit a whole symphony orchestra! Michael’s piece had to be programmed as the entire first half, so it could be set in advance and then struck during intermission to make room for the rest of the repertoire on the program. Needless to say, touring with such a program was completely unworkable, not to mention impossible to finance. Marina, who travels with a flute and a piccolo, was frustrated and baffled. So was I. Strangely, I think Michael was too. As with Mather’s concerto, Colgrass’s piece was performed only once. He eventually returned to the steel drum in his Pan Trio, composed for the virtuoso Liam Teague in 2008. Around the time we began to receive the music for the Mather and Colgrass commissions NEXUS was touring a great deal. Takemitsu’s concerto was in demand and my pans, safely in Case #21, were often in transit by truck or air freight during times when I needed them for practice. 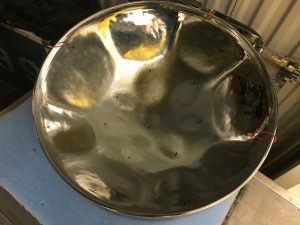 Early in 1994 my steel pan savior, Paul Ormandy, had taken them along with some of his own drums to a relatively new company in the U.S. called Panyard to get a tuning touch-up known as a “blend”. I mentioned my problem to Paul, and asked him to find out if Panyard could copy the old Phase II tuning on a new set of double tenors. I needed exact copies – same dimensions for each pan, and precise placement and size of every note. The tuners at Panyard took measurements of my instruments, and then I got a phone call from one of the owners of the company, Shelly Irvine, asking me if I would be interested in a free pair of new pans in exchange for giving Panyard an endorsement and permission to use my photo in their advertising. At the time I considered myself an absolute novice pan player (I still do) and was surprised by his offer, but I said if the pans they make are what I need, and sound even close to my Harrigin pans, I would be agreeable. I soon received a new set of double tenors that perfectly matched my originals. Although the Panyard instruments were slightly darker sounding, and had a bit more resistance than Harrigin’s, they were beautifully tuned and crafted. In addition, Panyard sent me a pair of stands with carrying bag, and heavy-duty cases for the pans. I was very happy to agree to their terms, and for several years my photo appeared in Panyard’s advertising along with many really great players. I often cringed when I saw my picture in their catalogues. In 1997 Paul Ormandy asked Robin Engelman to compose a piece featuring steel drums. Knowing my pans, and planning on NEXUS performing the new piece too, Robin wrote a quintet featuring double tenors as a prominent voice. The resulting work, Lullaby for Esmé, became a staple on our concerts for a number of years, and was recorded in 2001 on the CD Lullaby. I fou nd the darker quality of my Panyard instruments suited the nature of Robin’s piece better than my Harrigin pans. They blended well with many of the unusual and resonant sounds chosen for the orchestration, which included large almglocken and temple bowls. The second set of drums gave me more than just a practice instrument, they turned out to be a useful alternative sound option. In addition to playing the parts in new compositions, I began to incorporate my pans in free improvisations on NEXUS concerts. I also used them on two completely improvised recordings: the NEXUS CDs Origins (recorded in 1991), and Garden of Sounds (recorded together with clarinetist Richard Stoltzman in 1999). In these contexts I generally used the rack from my Takemitsu setup to suspend the pans. That way I could have them close to any other instruments I chose to use, including small things on a padded table and/or drums on stands. Using steel drums in this way was interesting because usually I don’t know what note is going to come out of a particular spot on the instrument. 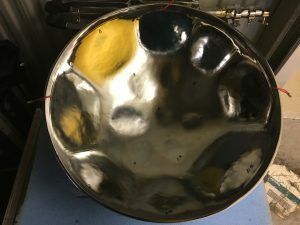 The pitches on most steel pans are organized in more or less concentric circles, as opposed to the straight lines of marimbas and vibraphones. A physical gesture in a certain direction on a xylophone is predictable in terms of lower or higher pitches. For me, a familiar movement by my hands on the pans produces almost random-sounding results. My last serious work with steel drums was learning a concerto by the distinguished Canadian composer R. Murray Schafer, commissioned for NEXUS and the University of Toronto Orchestra. His piece SHADOWMAN was premiered on February 3, 2001 in the MacMillan Theatre at the UofT Faculty of Music. 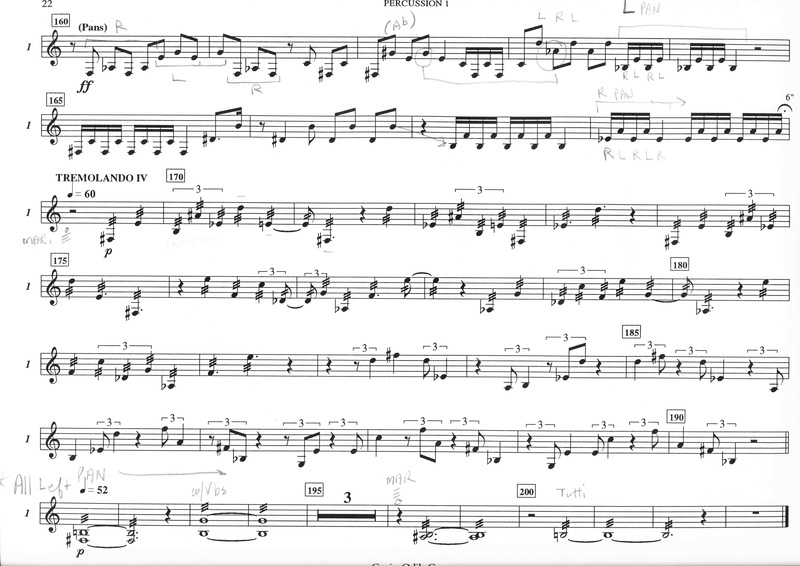 My part in this piece also includes vibraphone, songbells, and a few other small instruments. Although pans are not featured nearly as much as in earlier compositions, I still needed to memorize the music the same as before. Looking back to 1990 and Takemitsu’s concerto, I now feel grateful to him for opening an unknown door and forcing me to step through it. At the moment I saw those double tenors in the trunk of Paul Ormandy’s car I couldn’t imagine where in the world these instruments might take me (or where I would take them). They presented tremendous challenges, but also offered an opportunity to explore completely magical sounds in some fantastic new repertoire.